Hashtag 59 would like to welcome our newest contributor, Stacey K! She is a PADI certified Advance Open Water diver always in search of an adventure in or out of the water. A fundraiser by trade, Stacey is involved in her community, is always down for a glass of wine and has the most welcoming heart out of anyone I know! 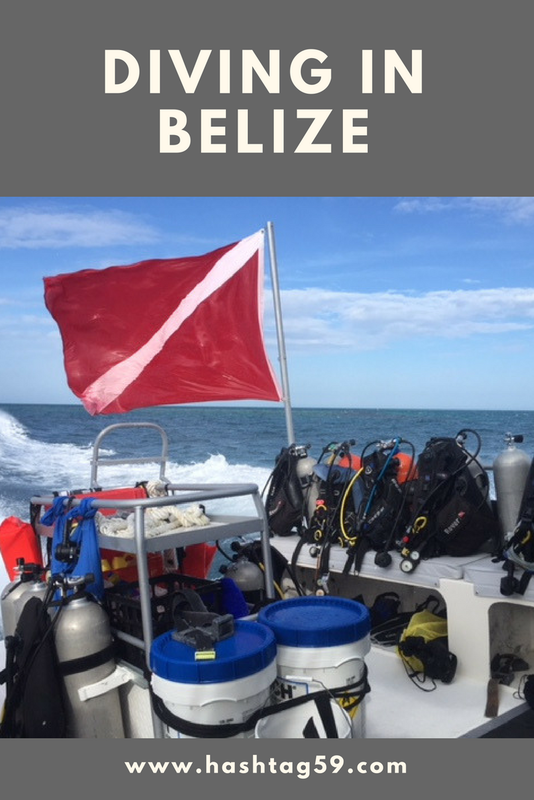 Stacey recently traveled to Belize over the holidays and is sharing her trip, along with some diving attractions for you! Madonna’s 1986 hit, “La Isla Bonita” was written about San Pedro, Belize on Ambergris Cay. I have been home for a week, but like the 80s pop icon, I am still dreaming of San Pedro. What was once a sleepy fishing town has developed into a traveling destination. San Pedro has kept intact its original charm and island pace with direct access to the beautiful Gulf of Mexico. Tourism in Belize has increased exponentially over the past decade and growth and new development are evident. However, San Pedro does not have a resort feel and it is less than a block walk in most places to get off of the strip and find authentic Belizean cuisine. The country’s official language is English, but you will hear Spanish, Creole, and Garifuna (indigenous language). Official government cars and golf carts are the only vehicles permitted on the island. Ambergris Cay is 25 miles long and 1 mile in width which allows beautiful vistas for sunrise and sunset. My attraction to Belize was for the scuba diving and I was not disappointed. Divers, it lives up to the hype. I went through Island Divers for the local dives. They are an Authorized 5 Star PADI Dive Center with small boats going out daily. The owner, Rudy, and his son Rudy Jr. guide most of the dives and are true experts of the sea. The reef is a 5 – 10-minute boat ride off the shore. Nurse sharks hear the boats and follow the guides like they are pet dogs. Reef sharks keep their distance but were present on most dives. The coral was vibrant and the schools of fish were plenty. Conchs, lobsters, eels, and crabs were visible on almost every dive. Lionfish (an invasive species) are prevalent and it is legal for guides to spear them. Watching the nurse sharks feed on the speared lionfish was exhilarating. On one occasion, the sharks did not eat the speared lionfish, to which Rudy brought it to the surface, filleted it, added lime juice, onion salt and we feasted on the freshest ceviche I have ever had. Moments like these are why I travel! Locals and travelers alike recommend Shark Alley. I did not go there, but the feedback I received from this location was that it was overcrowded. However, if you are snorkeler, it is a good opportunity to be up-close to large wildlife. For divers, you will have similar experiences along the reef underwater. For the excursion to the Blue Hole, one of the top 10 dive sites in the world, I went through Ramon’s. The Blue Hole is 60 miles off the coast, a two-hour boat ride. The trip included pick up from the pier, breakfast, lunch and 3 dives. The Blue Hole is 140 feet descent to an underwater cavern with pre-historic stalactites and columns. You have 6 minutes to descend and the total dive is 25 minutes. It is a once in a lifetime dive, that goes by so quickly that you will need to spend time on the boat digesting what just happened, how deep you actually were and that the collapse of an entire island occurred in order for the cavern to become exposed. Pretty awe-inspiring! The other dives included in the trip were two of the best dives I have done in my life. Half Moon Caye Wall is right off the island of Half Moon Cay. I descended onto a sandy shelf, swam through a narrow tunnel surrounded by grouper. On the other side of the tunnel, straight ahead was a reef shark and the deep blue yonder. Behind me, a shale wall covered in the most vibrant coral I have ever seen. Schools of blue chromis and yellowtail snapper swam around our group. A gentle current moved us along the wall. You do need a level of experience to navigate the current and remain properly buoyant. At the edge of the reef wall was another sandy shelf and there were conchs, garden eel, and multiple rays. Lunch was held on Half Moon Cay. I am bird enthusiasts and was thrilled to learn that the island was home to the red-footed booby – only found on Belize and the Galapagos. There were frigates everywhere too. Imagine vulture-like birds with massive red balloons on their neck that are a display for mating and take 20 minutes to inflate and deflate. The last dive of the day was at West Point and had as many captivating visuals as the previous dive. Join us for a group hike HERE and sign up for our email list in the footer for a chance to win some fun prizes! Thanks for sharing your diving adventures with us, Stacey! If anyone has questions about where to stay, how to get to Belize, or great restaurants, check out Stacey's first blog post here!